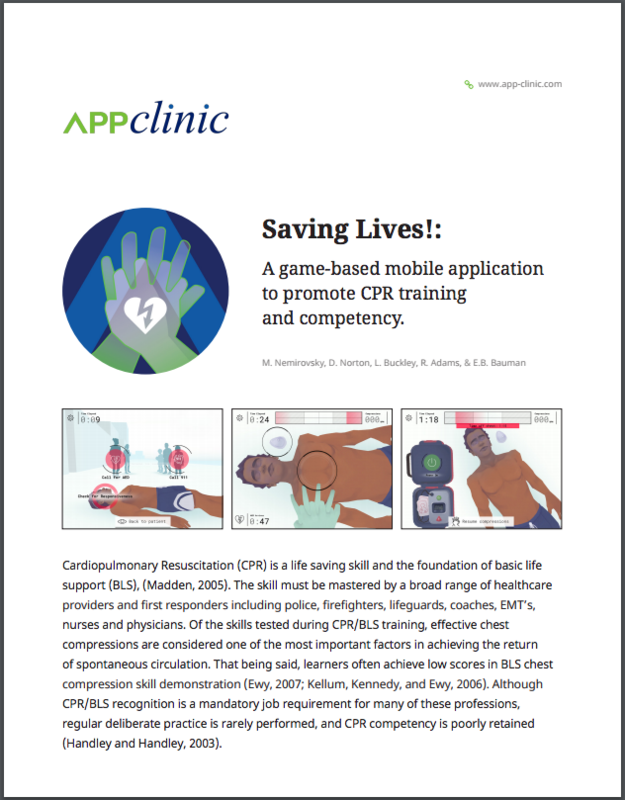 To celebrate the recent launch of the AppClinic series, we sat down with Matt Haselton, Game Designer at Filament Games and lead designer on Saving Lives!, AppClinic’s marquee CPR/AED learning game. We spoke with Matt about the inspiration behind the project and the particular advantages of delivering this kind of training content in a digital, mobile format. Check out the interview below! Why is CPR practice particularly well-suited for a mobile / digital learning game experience? I think the key advantage here is resource expenditure. Conventional CPR training is labor and time intensive – a traditional setup includes instructors, dummies, a classroom setting; in general, there are a lot of moving pieces and a lot of ways for costs to creep up. For an individual looking to be CPR certified, it’s important to stay well-practiced, as CPR certifications have to be renewed frequently, usually on a yearly basis. The convenience of having this type of training accessible via digital / mobile makes it so practitioners have an easy, turnkey way to keep their certification skills in shape before they need to be assessed. How does the game facilitate the practice of those certification skills? The game walks you through the entire resuscitation process step by step – you check the victim, you clear the scene, you check their breathing, you call for help, administer AED, and so on. It contextualizes each individual practice within a simulated emergency scenario. Because of the limitations of a touch-based mobile device, learning outcomes like hand positioning and depth of compression are represented through the game’s aesthetics, rather than actually embodied by player input. That said, the game is an incredible tool for embodying CPR rhythm, refining that internal metronome, because getting the “feel” of the optimal rate of 120 BPM is a sense you have to develop. Another interesting element of the game is that even if you deliver on 100% of the best practices for resuscitation, you can still lose the patient – this mirrors the statistic probabilities we encounter in real life. Naturally, the game still provides feedback on the quality of your techniques, but sometimes a patient simply cannot be recovered, and that’s an important learning for this practice as well. The human body is a complicated system – when administered, CPR affects the entire body in ways that are qualifiable, but not always obviously quantifiable, and so translating the whole-body impact of CPR / AED into something that can be quantified was an interesting process. We know for instance that in general there is not a set quantity of chest compressions required per patient, but in order for the game to function as a system we had to set those thresholds. Often times when we design games, we take a granular activity and make it more abstract and nebulous, but in this case, we were taking a more nebulous practice and adding granularity to it, in the service of creating predictable outcomes for players to pursue on the way to improving their technique. Learn more about the research foundation behind AppClinic’s Saving Lives! by reading the abstract below.